Writing is something I've always battled with. I've not battled with it because I'm dyslexic or have never had a mind for words, but because for a long time I was in love with the idea of being a writer and not actually the process itself. For sure, there's always been the desire to be able to write scripts and stories that could be turned into films one day. The actual germination of the idea and thinking about the process excites me enourmously, but when it comes down to actually getting a move on with it all I often falter. The idea of starting to write suddenly becomes too daughnting and the amount of work that needs to go into it makes me drag my heels. The idea gets shelved to be looked at some other time and I move on thinking about the next project I could think up then abandon. This isn't to say I never write anything. Just that I don't write as much as my soul wants to and not nearly to the same degree as the passion inside my stomach would suggest I should (or would). For example I've been incredibly keen to try and write a feature film script for quite some time now. Not because I think it's going to make me 'a proper writer' or because I'm doing it for thrills to my ego, but because I have a story in my mind that demands that kind of length. Furthermore the idea of getting into a story in that much depth as apposed to the 5-10 page scripts I've been making in recent years really bloody excites me. ACTUAL CHARACTERS WITH ACTUAL CHARACTERISATION. YES PLEASE! So here's the thing. 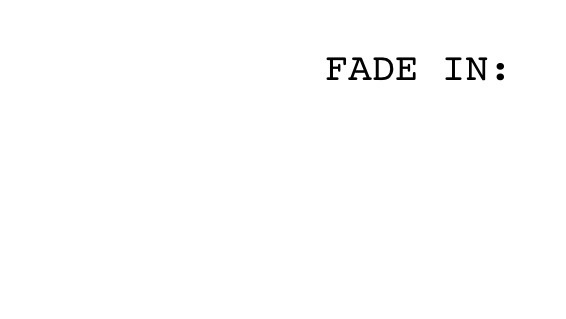 This feature script idea has been eating away at me now for the better part of a year. I've tried to introduce themes and elements of it into other ideas or scripts just to satisfy my desire to create the actual story, but they're never right, they never satisfy that desire. So what do I do? WRITE THE SCRIPT, GET IT OUT OF MY SYSTEM. It seems so obvious, but it's been something I've just refused to look in the face and address. So today I stepped into the abyss and went for it. I slipped my notebook into my back pocket and wrote down ideas and notes for the story throughout the day. I was also spurred on by a book, recomended to me by a fellow writer and friend named Otello, called 'Your CUT TO: is showing'. It's basically a formatting book, going through the do's and don't' of formatting when writing a feature length script and to be honest, it's given me just enough extra courage and motivation to go for this that I needed. Feeling in control of what I'm doing is really important to me when embarking on something creative. Even though a lot of the time I think I am and I'm not, it helps enourmously to have that extra boost. And that's what this book offers me. Time to start fulfilling this fantasy and making it more a reality. I'll probably post a few updates on here as I journey through this process.